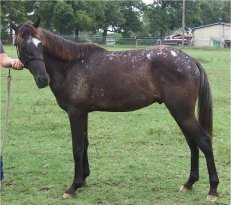 Rock's Dusty Admiral has all the typey appy coloring the sclera, striped hooves on all four feet and of course the white spots throughout the coat and he also has chestnut colored spots throughout his coat. We have had him since he was 6 months old and really appreciate what a great colt he has turned out to be. He has been started under saddle and is doing well he is 15.1 hds right now and we expect him to make 16 hds at maturity. We have a lovely double registered mare PSHR, NWHA, confirmed in foal to Rocky so we are expecting his first foal in summer 2008. 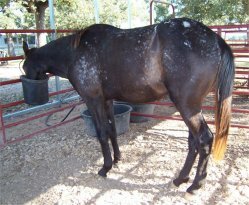 We are offering a very limited number of breeding to this young stallion in spring 2008. Rocky is registered SSHBEA, NWHA, PSHR, WHA and is eligible for several more.